"How, if I know all this, you may ask, could I hound him—shatter him again and again, drive him deeper and deeper into woe? I have no answer, except perhaps this: why should I not?" That was the quote that came into my thoughts after seeing a wasp bully a tarantula three times her own size into submission. 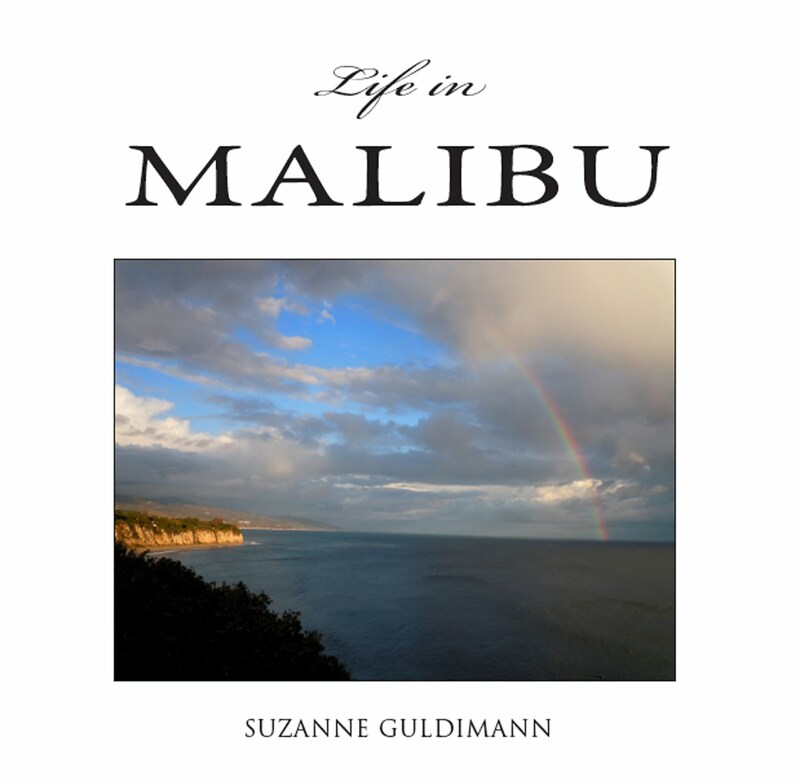 A couple of weeks ago, we featured the tarantula hawk on the Malibu Post. 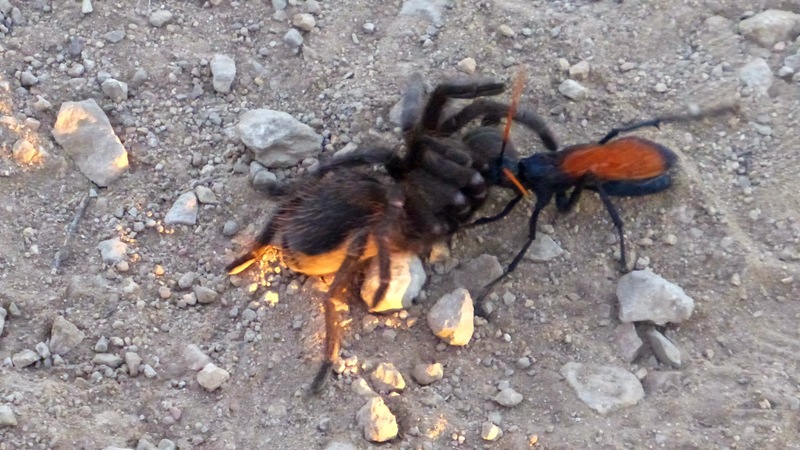 Last week, I had an opportunity to witness this delicate, fairy-like wasp subdue and drag away a full-grown tarantula. It was like watching a medieval epic in miniature, or a Japanese monster movie. 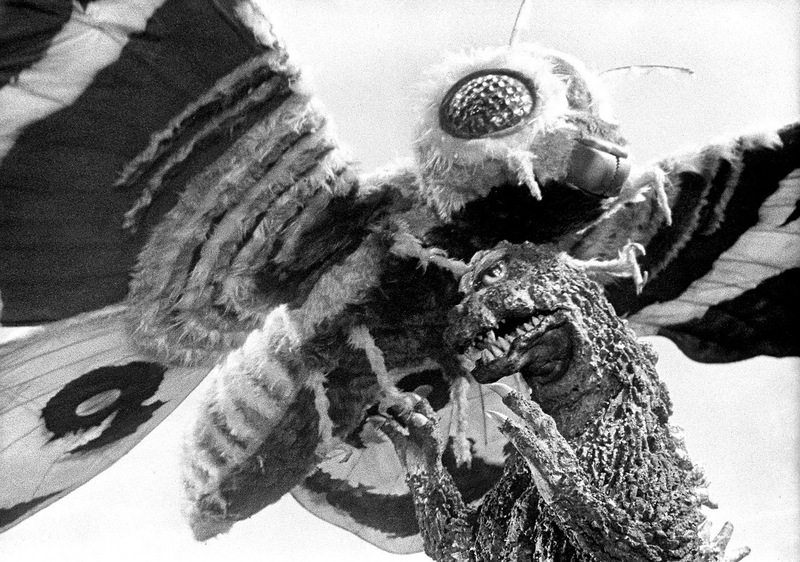 You don't really expect to encounter Beowulf and Grendel, or Godzilla vs Mothra, in the real world, even in miniature, but there it was. In the dusty trail at our feet, a hero battled a vast, hairy monster more than three times her size, and just as they are when the same type of archetypal scenario unfolds on the big screen, the sympathies of the human observers were entirely with the kaiju, the giant monster, not the monster slayer. The fate of being paralyzed with the second most painful insect sting in the world and dragged away to to become an unwilling nursery for wasp larvae was too horrible to contemplate. 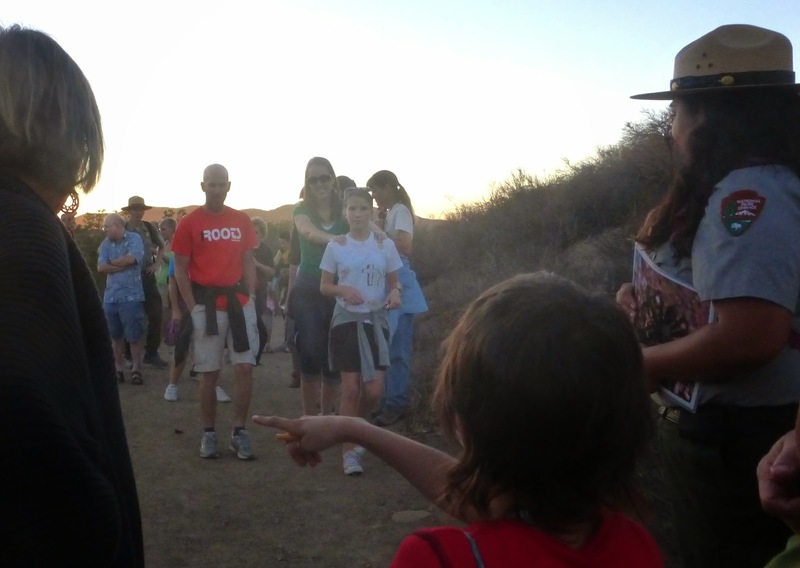 A young hiker hiker participating in the National Park Service's "Creatures of the Night" hike at Rancho Sierra Vista, points to the epic battle between wasp and tarantula taking place practically under the feet of the other hikers. 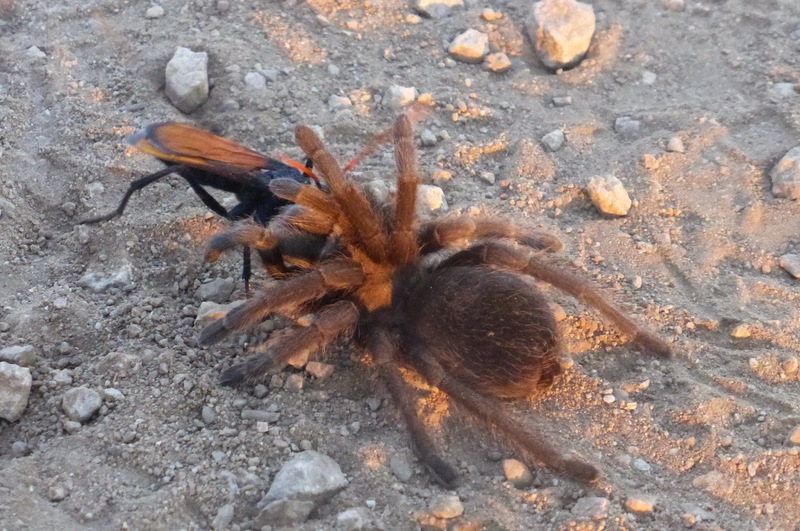 The wasp tackles the tarantula head-on, poking it with her antennae to get it to rear up and expose its underparts. Female pepsis wasps have been observed going into tarantula burrows and herding the giant spider out into the open. The hapless spider is dragged across the trail in the direction the wasp wishes to go. 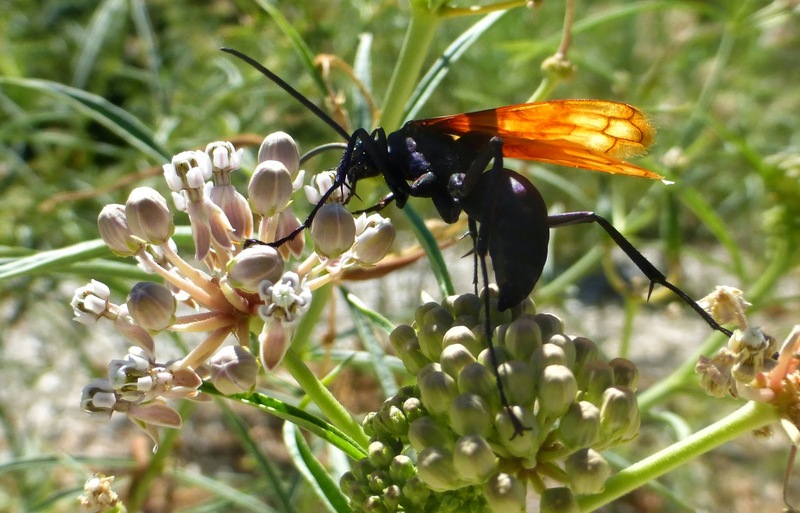 The wasp is equipped with spikes on her legs to help grapple her much larger prey. 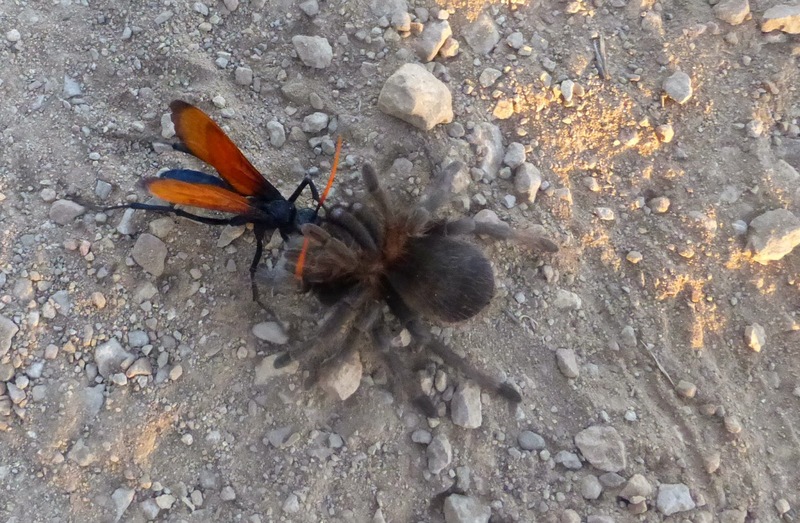 The wasp flips the spider over and administers its sting, paralyzing her victim. The wasp carts her victim away at an amazing rate of speed, leaving a track in the dust. Somewhere nearby she has a hole or burrow prepared. She may have to drag the spider for as much as 100 feet to reach her destination, once there, she carefully lays her eggs on the spider, stuffs it in the prepared hole and leaves it to become the food source for the next generation of pepsis wasps. 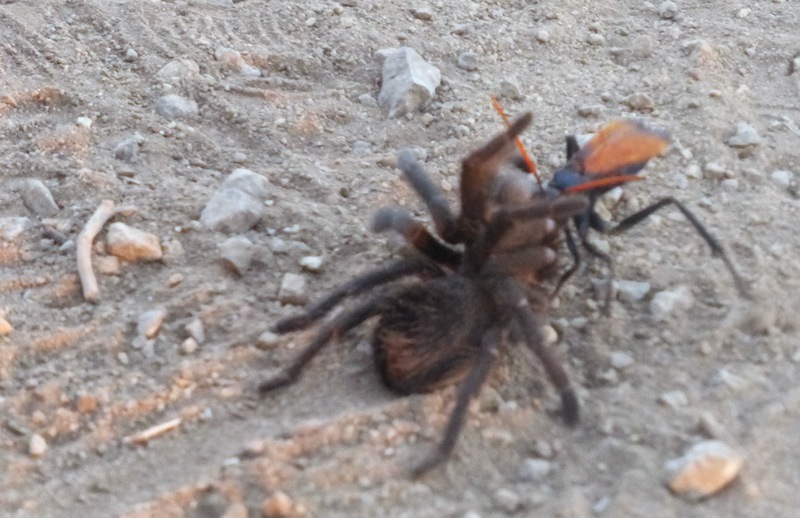 Sorry Godzilla, after seeing the tarantula hawk at work, my money's on the moth. Nature is far stranger than fiction.